Escape Adventures offers mountain bike tours for beginners to advanced level riders. For those who are just beginning their biking experience, but are still looking for amazing views and breathtaking landscapes, we would highly recommend our Escalante INTRO Mountain Bike Tour. Escalante National Monument is one of the largest stretches of roadless wilderness left in the West. Amidst this epic high country, we find what celebrated adventure author Zane Grey described as “a stairway to the sky”: a 7650-ft. high plateau known as the Grand Staircase. In the summer months, from the Aquarius Plateau—North America’s highest tableland or tectonic uplift—a series of 10,000 and 11,000-ft. peaks, with extraordinary vistas even for a state known for scenery, we follow primitive trails dotted by hidden lakes and streams. Large herds of elk crisscross the trail, while 13 types of raptors nest above. We admire canyon walls inscribed with Native American petroglyphs and pictographs and then relish in the cool, pure water cascading from 146-ft. high Calf Creek Falls. From the high alpine terrain of the Aquarius Plateau, to the deep canyons of the Escalante River, discover a fantastic array of backcountry cycling! These primitive trails reveal secret canyons and spectacular mountain vistas. 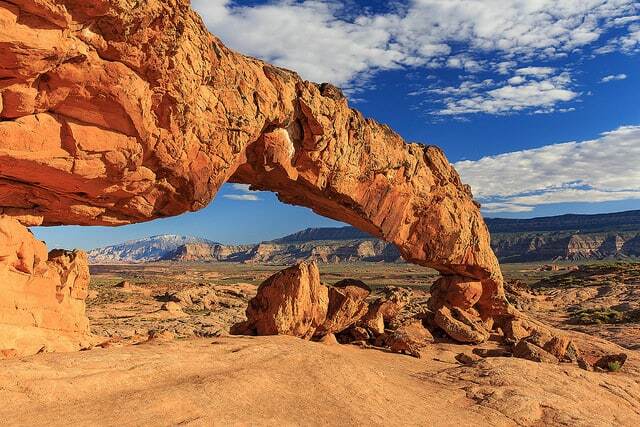 Trip highlights include cycling atop the highest plateau in North America, visiting John Wesley Powell’s favorite lookout point, cycling across Hell’s Backbone and the exciting Gap Mountain Trail. For skilled riders who match go-deep endurance with long-in-the-saddle experience, Escalante Mountain Singletrack is nothing less than a superb, multifaceted trip. Conversely, the Escalante Intro Tour provides all the same enormous vistas, though set on far less challenging dirt roads mixed with doubletracks. Day 1-2: Meet in St. George then shuttle to Escalante for dinner and introductions. Ride Aquarius Plateau to Posey Lake. Day 3-4: Ride Hells Backbone to Boulder. Ride Burr Trail, hike Calf Creek Falls. Day 5-6: Ride Barney Top and Powell Point, Casto Canyon Red Canyon singletrack. Sound interesting? If so, click HERE and request a detailed itinerary. This trip is rated on a fitness level of 1-2 making it perfect for families, kids, and intro mountain bikers.